Having a lot of glass windows is seen as a plus by a lot of people, however there are risks and issues that can make it harder. Window security film is designed to combat several problems associated with having glass windows. Security film is a neat product for making glass harder to breach. Intruders have to use a lot more force and the resulting noise can give you more time to react. 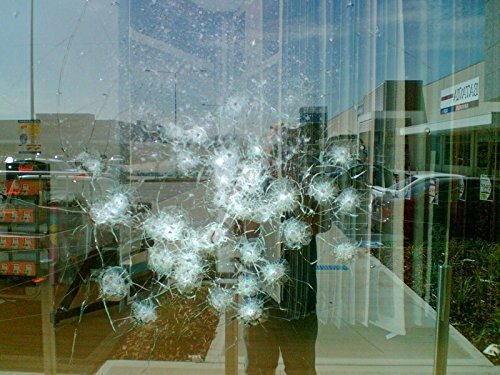 Security film can also save lives by keeping the glass from windows and doors from becoming sharp projectiles when subjected to major forces and it can reduce the speed at which a bullet or object enters your home or business. 3 So what good is window security film? 5 Film is less expensive than switching to tempered glass if your windows are not otherwise in need of replacement. 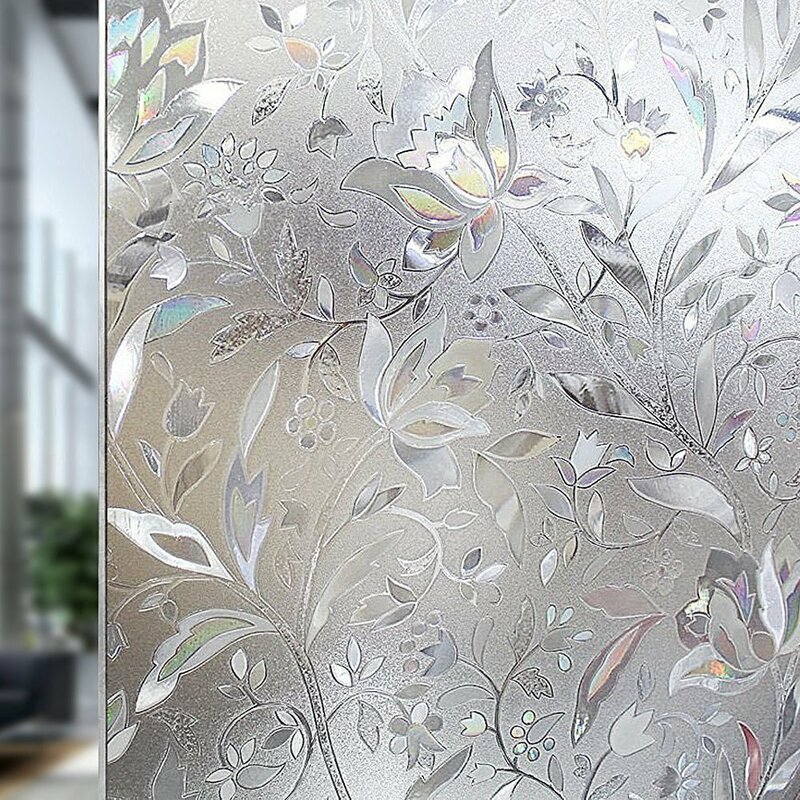 5.2 Security film can be beautiful and decorative. 13.1 Have you every used security film? Do you have any tips for those considering it? I am curious if any readers have used it on decorative windows and how that worked out? 13.2 As someone that has used plexiglass before, I have to wonder if window films discolor over time? 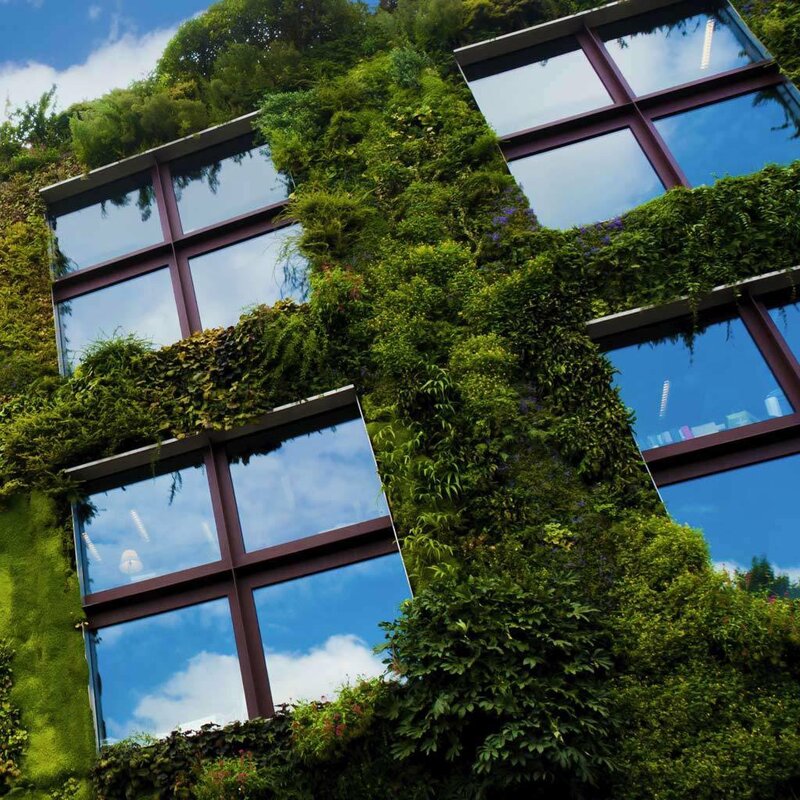 When researching the useful life of window film, I read you can expect 10-15 years. I imagine that how much sun you get is going to be the major factor in lifespan. Have any of you had window film for years at this point? Sure it is great to have a good view and let light into your home or business. Having a lot of light can help with mood, decrease the amount you spend on lighting, etc. However, the visibility and exposure that windows cause, especially on ground level or if you are near other multiple story buildings, can mean others can clearly see what is going on in your home or if you have valuables that are enticing to thieves. Those that are up to no good may see that you or someone else is home alone or that the building is probably empty. Clear security film of course only offers you protection from shattering and provides no privacy. Some of the films discussed further in this post also offer a mirrored appearance on the outside and a clear but subtly tinted one-way view from the inside looking out that can be a good compromise for some people. The glass is the weakest point in the exterior of your home. Even glass that is tempered will break with some force and something like a carbide tip tactical pen. Glass can be shattered and it doesn’t even make that much noise if care is taken. With so many people completely absorbed in music, video games, watching tv, or just talking to others, it can be amazing what can be going on all around and that no one notices. In the small town we live near, someone got caught with their pants down and streaked down the main street and only a few people noticed on a busy day. So what good is window security film? Security film is something anyone can use it to get some extra privacy. Some films are glued on while others use static. This means even if you are renting, this is something that you can do to increase your privacy and security. 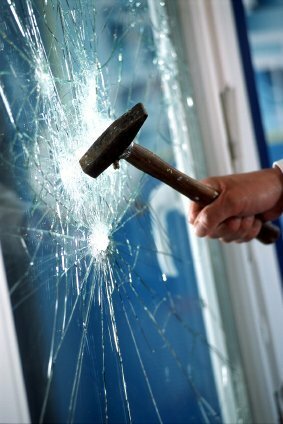 Security film keeps the glass from shattering into harmful or fatal shards. It was invented in response to the problem of blasts or bullets actually shattering glass and the shards causing damage. The shock from explosives can channel and travel a much greater distance than you would think. If buildings are lined up properly, blasts can channel a block or two and blow out windows. It doesn’t have to be your building that is taking the main hit. You don’t have control over what is going on a block or two away but you can do something to prevent glass shards from raining down on you, your children, and pets. 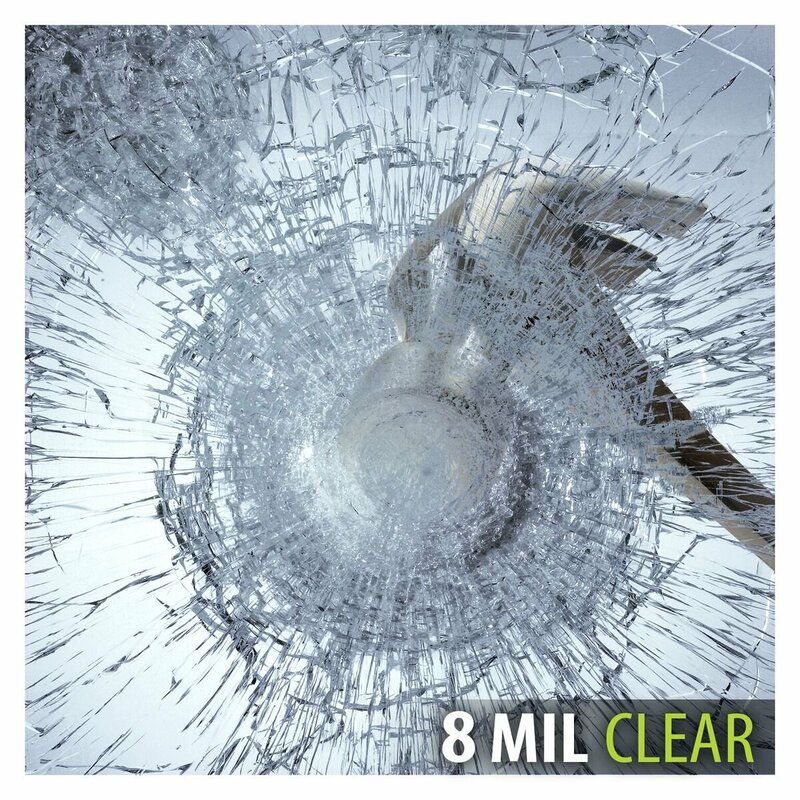 Getting a bullet through your window is horrible enough without worrying about glass shards. There are a lot of different natural disasters that could lead to a broken window. High winds or tornadoes can hurl objects through the glass. Thick window film can help prevent objects from making it as far and will eliminate the glass shard issue. Fire can also blow out windows. At least with window film, they will not be as likely to cause injury. 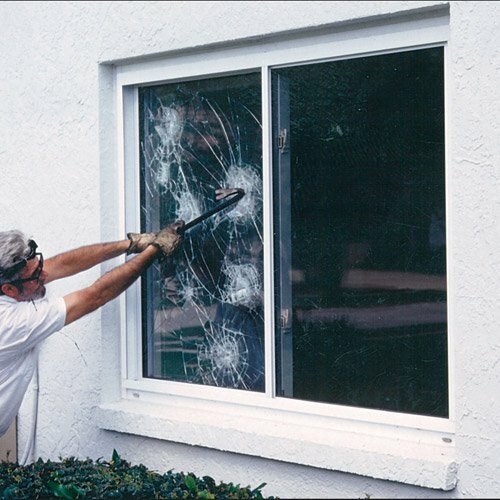 If you need to escape through a window during any type of natural disaster or fire, then having the glass where it can be broken but not shatter can make it easier to create a safe hole to crawl through. There has been a lot of people cut trying to escape. If you live in an area that regularly experiences some shaking then having tempered glass or thick security film is highly recommended. It doesn’t take much of a shake to spell trouble for your windows. Spend the extra money to get the 8-12 mil thick film if you live in an area of seismic activity. Film is less expensive than switching to tempered glass if your windows are not otherwise in need of replacement. One thing we learned when building our house was that any glass on doors or close to the door needed to be made of tempered glass. I think the main issue the building code people are concerned with is security. Since tempered glass costs more than regular glass, people usually only use it when necessary. If you have ever seen a busted windshield or car window then you might have noticed how it cracks and does a starburst pattern but holds together really well. It has to be very shattered to just collapse and fall and when it does the pieces are tiny and while capable of cutting you, they are not jagged shards that are likely to cause great damage in a crash. Changing regular glass to tempered is not realistic or even possible for most. If you are building a new house or have to replace your glass anyway you might ask for a quote if you are really concerned about strength, safety, and security. There is a chance it would be cheaper than using film on all your windows. The glass around doors or that is built into doors is often already tempered. This means that adding thick security film will give you a very tough piece of glass. If there are windows that you are very concerned about than replacing the regular glass with tempered and adding the thickest security film you can find is going to give you the most protection short of getting actual bulletproof glass. 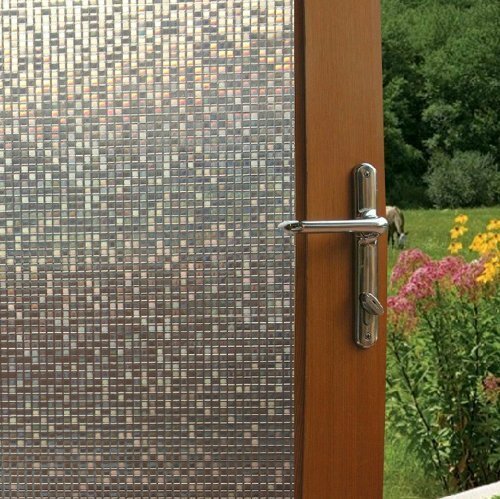 Security film can be beautiful and decorative. There are plenty of people that use security film for a little extra privacy but they also use it to change the look of their home. Some films offer gorgeous designs and colors that offer an inexpensive way to change the way your place looks without spending a ton of money. If you get tired of one design, you can peel it off and try another. If it just uses static to stick, then it is a lot easier to change designs. If you rent, it can sometimes be hard to find ways to creative ways to make things look different. Film can be used practically anywhere. Many films that have a primary purpose of shatter proofing rather than security, have an easy to find thickness listed. 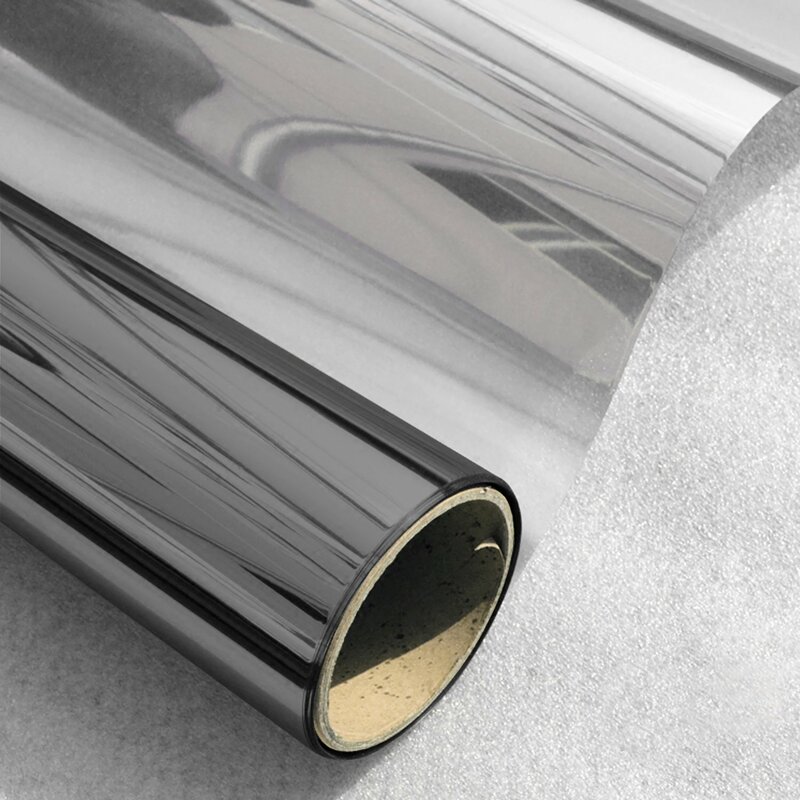 The thicker the film the more durable and more protection you are getting. Thicker costs more naturally. Please take note that the films below come in many different sizes. Make sure to measure your windows before ordering to ensure the right size. If your window is slightly smaller or odd size then just get the size that is a little larger than what you actually need and trim it down. As far as pricing, if you are doing a lot of windows, a long roll that you cut as needed is more economical in some cases. This would be my choice for thick window films where you just want to maintain the look of clear glass. It is pretty amazing what a layer of film can do to. The pictures above are supposed to be actual tests of this film. If count correctly, the bullet-riddled window withstood shattering even with a full clip of ammo unloaded into a small area. Looks like 9 mm to me so that is a good test since it is such a popular caliber, especially among street gangs. This film is interesting because it offers a mirrored effect from the outside while those on the inside can see out well although with a slight tint. This does a good job at offering privacy while still letting in a lot of light and not obscuring the vision of those looking out. This film is just plain pretty and a great way to spruce up a window that has seen better days or just if you want something that looks like high end stained and frosted glass without the price tag. 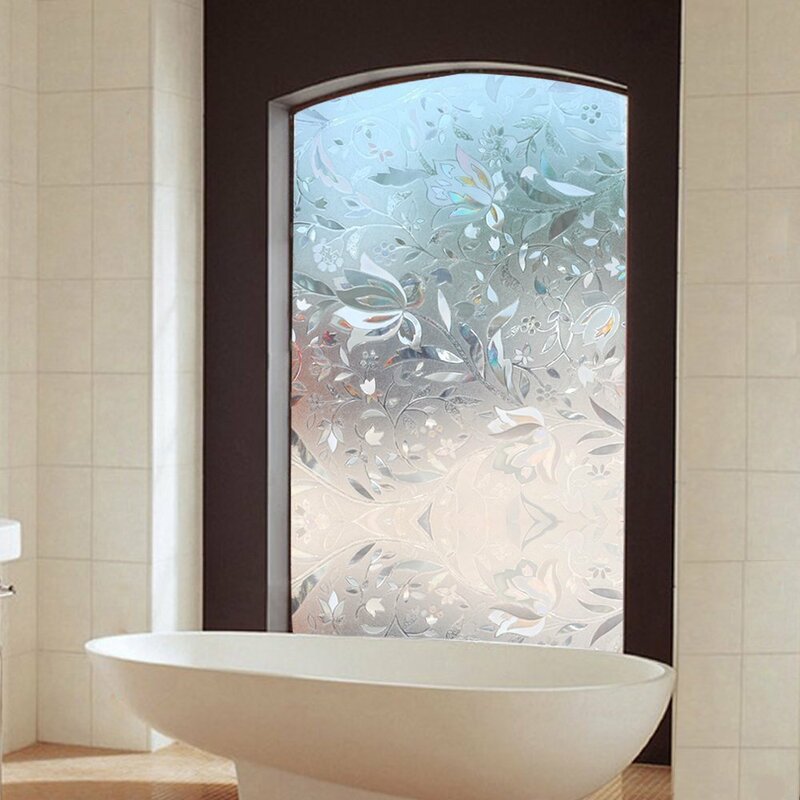 This can be used to make bath areas more private or turn entry door glass to frosted. The light shines beautifully on this particular film creating an effect that would look good anywhere. I think this particular film is mostly for privacy and not shatter resistance but any film is going to help keep glass together if it experiences any impact. 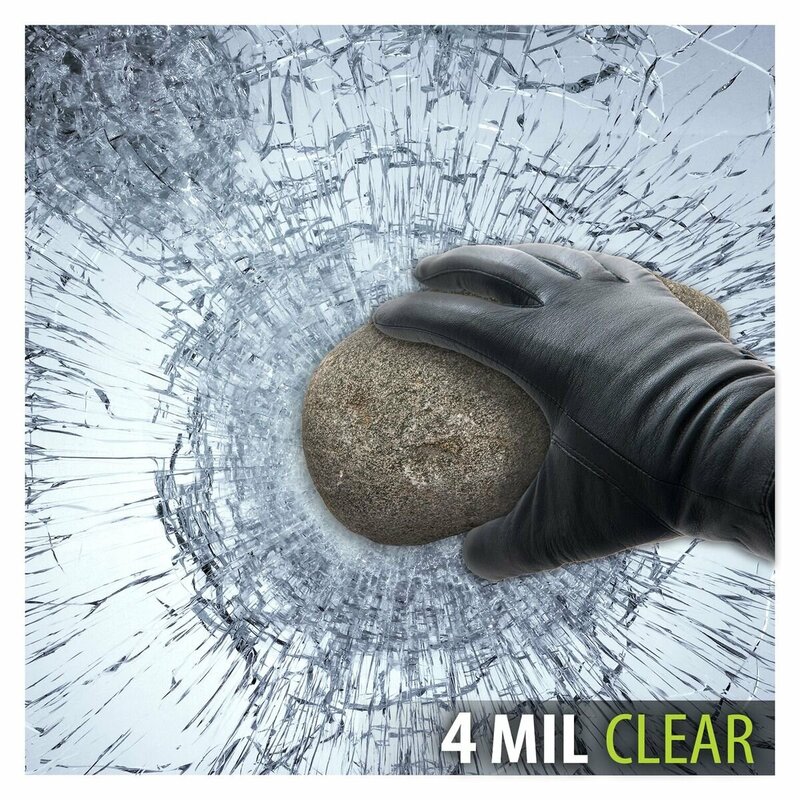 If you want some protection against objects but are not too worried about major disasters then 4 mil is fine. You get protection but the cost is more reasonable. This is also fine for reinforcing tempered glass when you want a higher level of protection or even to just protect your main windows from scratches and small chips. Decorative windows can benefit from clear protective coverings but if they have raised designs like stained glass it may be difficult to get it to stick right without air bubbles. Smoother surfaces are better for films. This film is primarily for offering privacy but it is also pretty to look at. This is a good choice for those that don’t want to use curtains or blinds on entryway doors or nearby windows. This can be nice for those living in ground floor apartments to use and it is very easy to apply. This is fun stuff for a kid or teens room or anywhere you want a special touch. This is a good size for protecting smaller width windows or using for windows that have panes and gridwork. The 12″ width means you can cut it in half for a 6″ wide pane. This 8 mil thick film is thick enough for protection on groundfloor windows. This roll is enough to do two windows that are 30″ x 39″ if you cut carefully. The thickness is a good compromise between the higher cost 12 mil and going with a thinner 4 mil layer of protection. It is essential that glass is cleaned well and dry before you put any film on it. Any little flecks of dirt or debris are problematic. You can get a kit that helps with application. If your windows are really dirty you will want to wash them with soap and water or water and vinegar and then use glass cleaner to get rid of any streaks. Give it a few minutes to dry and then apply your film. Don’t allow too much time to pass because you will be amazed how fast debris can start to cling to windows especially with pets in the home. Have you every used security film? Do you have any tips for those considering it? I am curious if any readers have used it on decorative windows and how that worked out? As someone that has used plexiglass before, I have to wonder if window films discolor over time? When researching the useful life of window film, I read you can expect 10-15 years. I imagine that how much sun you get is going to be the major factor in lifespan. Have any of you had window film for years at this point? Can window film be removed without leaving a residue? Can you use these films on double pane glass? Some styles of Con-Tact paper are also good window coverings and I’d guess that they also would prevent shattering because Con-Tact paper is fairly thick. Over the years I’ve put their paper that looks like frosted glass on windows and doors. It stays on forever (although easy to remove) and doesn’t yellow, but it does shrink around the edges a tiny bit. Other styles that would be appropriate for glass are decorative or translucent. I haven’t checked to see if they have a film that blocks vision from the outside while allowing vision from the inside. Amazon has pages of different styles. Thank you for your review of window films. I have been wondering about using them and now I have more information to guide my decision making! Last year I hit the side window of my truck with a rock from a mower and didn’t even know until I started to drive away. It has may merits though I caution you to not make your windows too tough as you might need to exit them in a hurry during a fire or structure collapse from an earthquake or tornado damage etc.. Just film on it is ok though. Our schools recently put the reflective film on to keep any shooters from seeing in and shooting kids from the outside. Please, stress to your people that before you put Shatter Safe type window films on your glass you ask a lot of real hard assed questions. Your household and business glass is only 1/8th of an inch thick and WILL NOT STOP A BULLET even with the thickest films available. In order to accomplish any type of bullet resistance a single pane of glass must be at least 1/2 an inch thick. My company will not apply our Shatter Safe Bullet Resistant Window Film if the consumer is not 100% certain of all the facts. Once they replace their glass with thicker glass, only then will we offer the solution. Check our site when you have time. 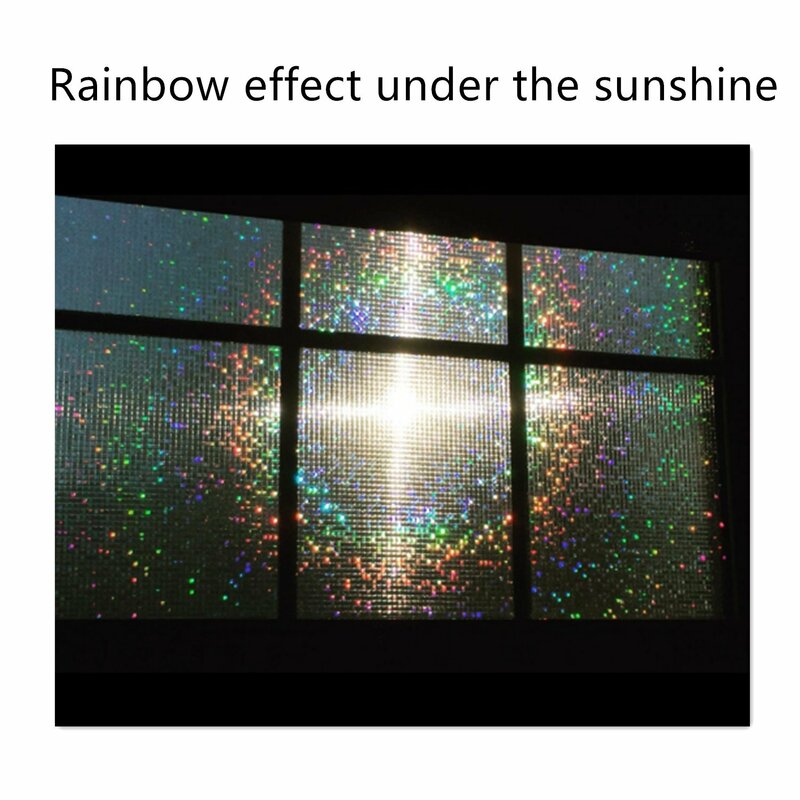 I have had 3M Impact/UV Film on my house now since 2005. It works great. During Hurricane Irma, while everyone was putting up plywood and installing shutters, I really had no worries. Made it through Hurricane Irma and I live on the East Coast of Florida. Thanks for mentioning how a window security film should be strong and durable. I also like how you said that they should also be protective. My father is looking for a window security films for our house to make us feel safer. Looking to harden the target and deter most smash and grab burglars. I already have safety doors and video monitoring. Privacy tinting is a plus in the back. Thanks for sharing this post with us. This is actually a good and useful piece of information. I really enjoyed browsing your blog post. I’m glad you shared this helpful information with us. Thanks for sharing this information.